The prevalence of allergy development is increasing. Currently, already 30 to 40% of the world´s population are affected by allergic diseases. Allergic diseases are caused by environmental allergens that can be clustered into four groups depending on their site of exposure: inhalants, ingestants, contactants and injectants[2, 3]. Allergies manifest themselves either locally for instance as allergic rhinitis or hay fever, allergic asthma, food allergy, allergic skin inflammation, and ocular allergy, but allergies can also lead to systemic, so called anaphylactic, reactions. Trees, grass and weeds are able to release pollen into the air during their flowering period. Pollen are transported by wind and may eventually find their way into the respiratory system of humans. Here, allergenic compounds within the pollen are able to activate the immune system. Such compounds are classified as “allergens”. In allergic patients, the immune system recognizes the innocuous pollen as a “danger signal” and thus produces specific IgE antibodies against it. IgE antibodies are specialized proteins produced by the immune system and together with symptoms can be used as a clinical indicator for allergy. The process of IgE production caused by an allergen is called “allergic sensitization”. 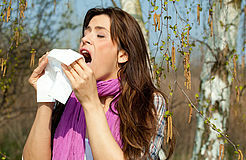 Upon re-exposure to pollen/allergens allergic patients develop allergic symptoms such as, rhinitis and conjunctivitis. In Europe, 10% of the population suffer from “hay fever” symptoms caused by pollen, and 76% of allergic patients are allergic to pollen. In vast parts of Europe, birch pollen (Betula verrucosa) has been described as the main cause for spring pollinosis. 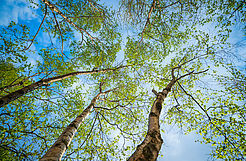 Birch pollen allergic patients mostly suffer from symptoms affecting the respiratory tract such as, sneezing, coughing, scratchy throat and allergic asthma. Other symptoms include, gastrointestinal disturbances, swollen eyes and inflammation. 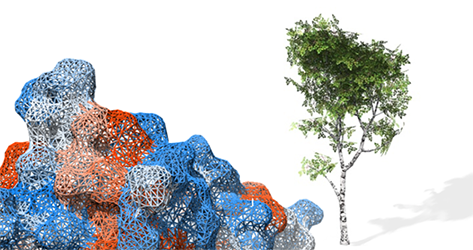 Over 95% of all birch pollen allergic patients are sensitized to one particular birch pollen protein (allergen), which is called Bet v 1, rendering it the major birch pollen allergen[6,7]. Due to a lack of immunological understanding as to the development of allergy, treatments are not focused on the causative molecular origin of the disease and currently most therapeutic approaches focus on the suppression of the associated symptoms of respiratory allergic diseases (e.g. prescription of antihistamine). The only curative treatment method available represents the allergen immunotherapy (AIT). Following a usual AIT protocol, the patient receives several vaccinations of pollen extracts over a period of three to five years. During this time, the immune system is programmed to tolerate the allergen, and thus not to further provoke allergic immune responses. The treatment is long-lasting and thus is able to improve the patient´s quality of life for a longer period of time, if not forever[11-15]! Sometimes AIT-patients develop side-effects in course of the treatment, such as local inflammations and swellings. In a few cases, also severe systemic reactions can occur. The occurrence of such side-effects in AIT is explained by the use of natural pollen extracts including IgE-reactive allergens. Molecular biologists found a way to overcome this issue by introducing generated hypoallergenic (“inactive”) variants of the natural “active” allergens. These variants are called hypoallergens. The variants are still immunogenic, giving them the possibility to reprogram the immune system to tolerate the allergen. This can be accomplished in absence of unexpected and undesired side-effects [16, 17]. 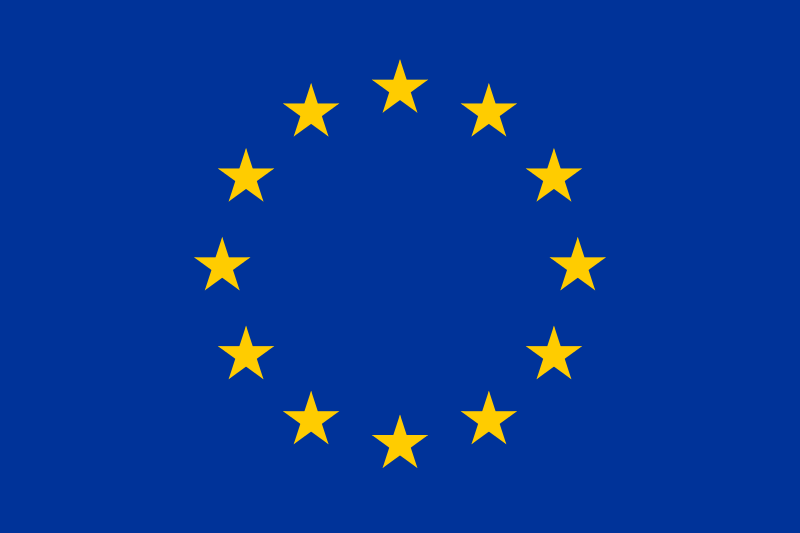 The European Academy of Allergy and Clinical Immunology (EAACI) is an association of clinicians, researchers and allied health professionals, dedicated to improve the health of people affected by allergic diseases. The EAACI has generated a special PATIENTS AREA providing information and advice for allergic patients worldwide. 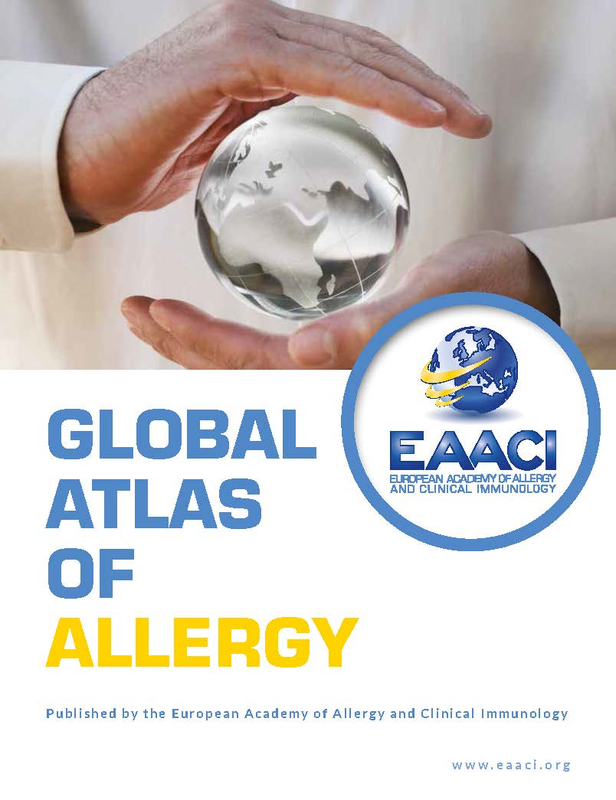 For more information on allergic diseases, the EACCI has released a "Global Atlas of Allergy", which can be downloaded as pdf document by using the provided link. Ruby Pawankar, G.W.C., Stephen T. Holgate, Richard F. Lockey, WAO White Book on Allergy 2011-2012: Executive Summary., in WAO World Allergy Organization - A World Federation of Allergy, Asthma and Clinical Immunology Societies. 2011-2012. Platts-Mills, T.A. and J.A. Woodfolk, Allergens and their role in the allergic immune response. Immunol Rev, 2011. 242(1): p. 51-68. Karp, C.L., Guilt by intimate association: what makes an allergen an allergen? J Allergy Clin Immunol, 2010. 125(5): p. 955-60; quiz 961-2. Chivato, T., et al., Allergy, living and learning: diagnosis and treatment of allergic respiratory diseases in Europe. J Investig Allergol Clin Immunol, 2012. 22(3): p. 168-79. Rentzos, G., et al., Intestinal allergic inflammation in birch pollen allergic patients in relation to pollen season, IgE sensitization profile and gastrointestinal symptoms. Clin Transl Allergy, 2014. 4: p. 19. Asam, C., et al., Bet v 1--a Trojan horse for small ligands boosting allergic sensitization? Clin Exp Allergy, 2014. 44(8): p. 1083-93. Smith, M., et al., Geographic and temporal variations in pollen exposure across Europe. Allergy, 2014. 69(7): p. 913-23. Kim, Y.H., et al., Correlation between skin prick test and MAST-immunoblot results in patients with chronic rhinitis. Asian Pac J Allergy Immunol, 2013. 31(1): p. 20-5. Cross, S., S. Buck, and J. Hubbard, Allergy in general practice. BMJ, 1998. 316(7144): p. 1584-7. Sastre, J., Molecular diagnosis in allergy. Clin Exp Allergy, 2010. 40(10): p. 1442-60. Ceuppens, J.L., et al., Immunotherapy with a modified birch pollen extract in allergic rhinoconjunctivitis: clinical and immunological effects. Clin Exp Allergy, 2009. 39(12): p. 1903-9. Akdis, C.A. and M. Akdis, Mechanisms of allergen-specific immunotherapy and immune tolerance to allergens. World Allergy Organ J, 2015. 8(1): p. 17. Kappen, J.H., et al., Applications and mechanisms of immunotherapy in allergic rhinitis and asthma. Ther Adv Respir Dis, 2017. 11(1): p. 73-86. Soyka, M.B., D. Holzmann, and C.A. Akdis, Regulatory cells in allergen-specific immunotherapy. Immunotherapy, 2012. 4(4): p. 389-96. Valenta, R., et al., Recombinant allergens for allergen-specific immunotherapy: 10 years anniversary of immunotherapy with recombinant allergens. Allergy, 2011. 66(6): p. 775-83. Luger, E.O., et al., Allergy for a lifetime? Allergol Int, 2010. 59(1): p. 1-8. Pelaia, G., A. Vatrella, and R. Maselli, The potential of biologics for the treatment of asthma. Nat Rev Drug Discov, 2012. 11(12): p. 958-72.